Talking to kids can be overwhelming. It’s not planned, it’s never planned. And you want to say the right thing so badly… the first time. 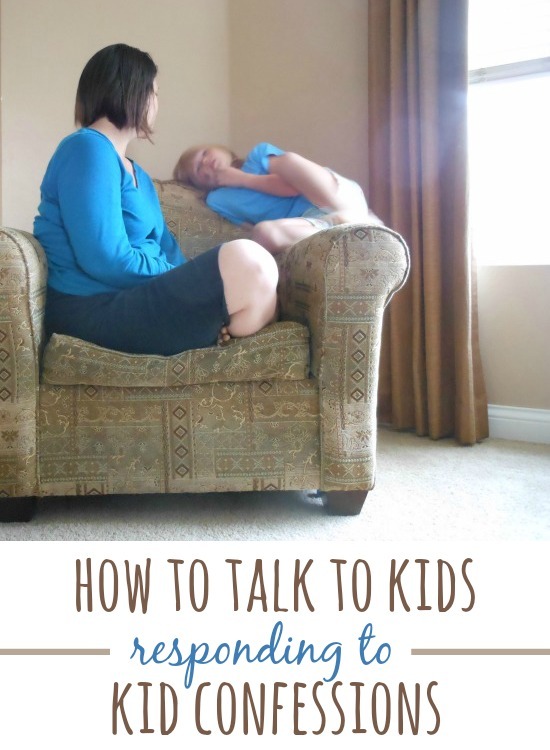 Just like anything with parenting, talking to kids takes practice. Lucky for you kids let you have lots of it! One of those times that having the right thing to say is so important, is responding to kid confessions. Your little one has just revealed something and you just don’t know how to respond. Below you will find tips for handling these sticky moments. “Mom, I was swinging branches from the tree.” Her head tilted slightly to the ground and her tone quiet, I knew this was a confession of less than ideal behavior. “Yeah, over my head.” I waited a minute to see if something would follow. “Sounds like you really learned something, thanks for telling me about it.” That was it. The subject was quickly changed. The conversation lingered in my thoughts for the rest of the morning though. So much happened inside of those few sentences. I wanted to dissect it… and then I wanted to share what I’ve learned with you. When she came to me with this confession I was doing cartwheels in my head. Did I really care that she was swinging a branch? Of course not. What I did care about is that she trusted me with something important to her. She wasn’t afraid of my reaction and perhaps she was even looking to me for extra guidance. She’s 7 now and a playful mistake isn’t huge in my parenting book, but she’ll be 10 before I know it, and then 13… and then (okay no need to think about that now. 😉 ). If she can come to me now then maybe, just maybe, she’ll be able to come to me with the hard stuff that isn’t all that far away. That’s my hope. Really listen and pause before answering. What is the confession about? Are they more concerned about getting in trouble or about what actually happened? Both are valid reasons to confess. Sometimes it can be easy to guide the conversation where you think it’s headed. When we take over the conversation in that way two things happen: the point is missed and the kids will likely tune out. Respect the weight of the issue. It doesn’t matter if it seems silly to you or if you don’t care. It doesn’t matter if you already know about it (like I did in this case), it only matters that it MATTERS to them. That’s it. This was so important to her that she had a hard time saying it. Respect how heavy the issue feels to your little one and treat it like it’s just as important to you. Be grateful. Did you notice that I thanked her for telling me? I do that all the time. I understand that at 7, she doesn’t have to tell me a darn thing. I understand someday she might walk past me and close the door without a shrug. I AM grateful and I want her to know it. (I will note that I refrained from picking her up and smothering her with kisses). Stay put. This is one time I don’t recommend getting down on your kid’s level. 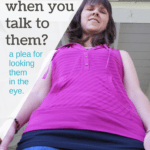 If they approached you while you’re doing dishes or walking side by side, it’s probably because they don’t want to look you in the eye. Ask why. Why did you do that? Is that the first question you want to ask? Me too! I think it’s just the first thing we think about. Why on earth would you do that? The problem is there isn’t a good answer. “Because I hoped someone would get hurt.” “Because I didn’t care about it until I was in trouble.” “I don’t know.” “Because I just feel like being a pain today.” See. No good answer. And if you can’t think of an answer that will satisfy your question you shouldn’t ask it. Instead remember that it doesn’t matter why, it matters what lessons were learned from it. “What would you do differently next time? What was the consequence and how did you feel about it?” These are questions that set your kids up for success. Let it become lecture time. A full blown lecture about what they should have done, will have the same affect as yelling. Kids who are tuned out and wondering why they confessed in the first place. Bring it up again. When the conversation is done, it’s done. There probably isn’t a good reason to bring it up again. (Unless of course this confession needs a consequence. I’ll give some tips for that below). If you do bring it up, make sure it’s with a positive spin. Wow! I noticed you looked around before you even picked up that branch. I’m so glad I got to see what you’ve learned in action! What if the confession is to something that hasn’t been addressed by another adult? In the case of the spinning branch, Dad had already handled it. (I actually knew all about it before she even told me.) Sometimes though kids will confess to something that no one knows about. That’s AWESOME… you know why? It means they didn’t have to tell anyone… and they still did. YAY! Of course the incredible honesty doesn’t mean there will be no consequence but handling it with respect will make sure they are willing to come clean in the future. While you are listening and questioning and respecting, try to figure out if the natural consequences were enough for you. Did you feel like the lesson was learned? If not, what guidance can you give to help your little one correct their own mistake? Something broken? Fix it. Someone hurt? Find out how to help soothe them. If you still feel like you need to take parental action, be calm. Revisit the issue afterwards and reiterate just how grateful you are that they came to you. Are there any tips you would add? Has responding to kid confessions been easy for you or a little more challenging? 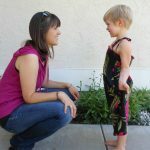 So impressed with this post and all the amazing tips, Jillian. I think I also answer with a “Why?” when my kid tells me something (or rather, a “How come?”). You’re right—there’s no good answer to come out of that. I like your approach of just getting them to keep talking, and to know that they can trust us. One thing I want to do with my kids is to make sure they feel like they can talk to me about anything. Often that means not reprimanding them right away (“Why should I tell mom if I’m just going to get in trouble?”). Or to pass judgment. Or to make them feel like they made a mistake in coming to you at all. Because I want my kids to feel like they can come to me and that they know I’m on their side. Even if they did something wrong, even if they know I won’t be happy with it. It’s not them vs me. It me helping them get through it. And I really liked your tip about respecting the weight of the issue. I’m big on that one too. It’s so, so easy to brush aside their “petty gripes” because we have the experience to know that in the long run, it won’t matter much. Yet they don’t; to them, this situation really is pretty hefty stuff. And it doesn’t matter that we don’t agree, it just matters that we support them and how they feel about it.